"Below is a grab shot I took recently at Lee Canyon Ski Resort in the mountains just outside of Las Vegas," said Kevin Miller. 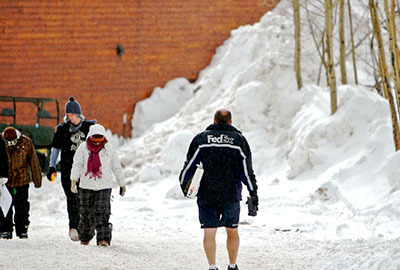 "I am sure most of this Fed Ex employee's deliveries were done in the valley below under the relative warmth of the sun, hence the shorts. The uniform definitely seems out of place in the snow." Kevin used a Canon 30D, with a 200mm lens set to f/2.8 in Aperture Priority mode. ISO was 100, and shutter speed was 1/2000 of a second. I had thoughts very similar to this!